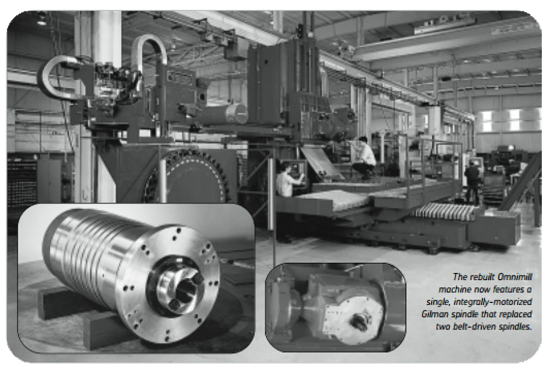 Single, 25 hp, CAT 50 integrally-motorized spindle replaces two belt-driven spindles. A major aircraft engine manufacturer wanted to upgrade to the spindle on its OM-3 and OM-4 Sundstand Omnimills (5-axis machining centers with a 150 degree tilting head). Material being machined was inconel, titanuim and other aerospace alloys. Converting the original two-spindle arrangement (a lowspeed spindle to handle large tools and a high-speed spindle for small tools) presented a number of challenges. A conventional rebuild would require a completely new slide casting together with a twospeed, timing, belt-coupled spindle cartridge requiring oil-bath bearing lubrication, a complicated design that would be both hard to adjust and maintain. The rebuilt Omnimill machine now features a single, integrally-motorized Gilman spindle that replaced two belt-driven spindles. 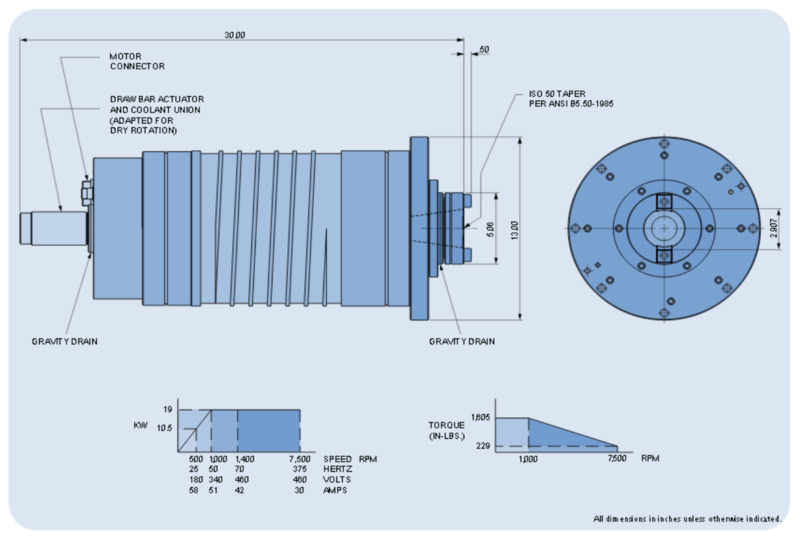 Instead of redesigning the head to accommodatea conventional belt-driven spindle, the machine builder suggested an integrally-motorized spindle for better functionality. Ultimately, the solution came in the form of a single 25 hp (18.6 kW) spindle, capable of 7,500 RPM, with CAT 50 taper and through-spindle coolant. 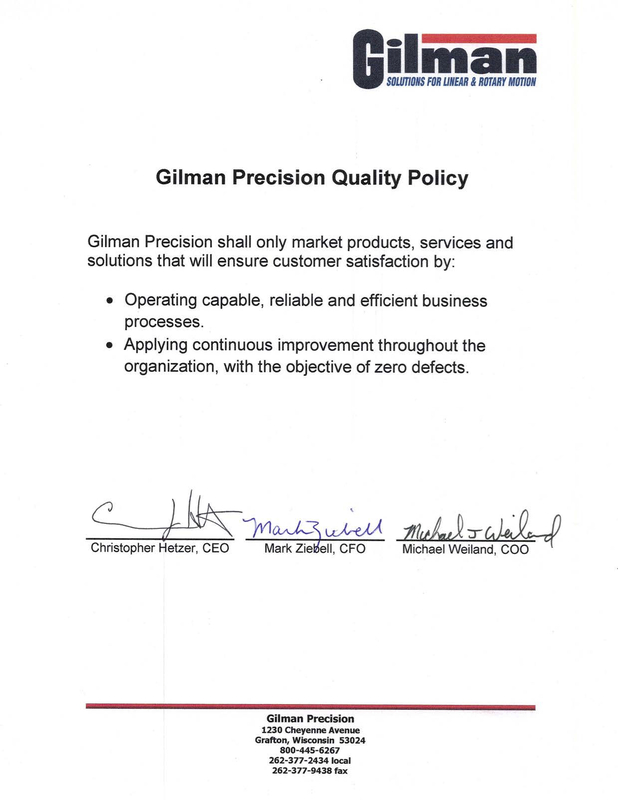 A stock spindle being unavailable, a Gilman engineering team visited the rebuilder to review the application. After research, the engineers recommened Indramat windings to fit within the severe space constraints of the head. A new head casting configuration, machined to allow coolant to circulate around the spindle body, allowed the spindle to drop into the housing and bolt through a flange, making spindle removal an under-30-minute job. To eliminate the problem of a hose band moving with the tilt head, the housing is also innerdrilled and plumbed to handle all hydraulic, coolant, and electrical requirements. Maximum thrust into spindle 1,200 lbs. The spindle is driven by an Indramat intelligent AC vector drive. Stop and orient mode takes less than 3 seconds at 7,500 RPM. The rebuilt machine has a wide range of speeds without gear changes. Redesigning and rebuilding the user approximately one half the cost of a new machine. Six machines have been converted to date. Total project time, from initial consultation to spindle delivery, was 18 weeks.